Chile rode on the back of goalkeeper Claudio Bravo’s heroics to see off Portugal in the first semi-final of the Confederations Cup at the Kazan Arena. Portugal just couldn’t beat Claudio Bravo, and as a result, the European champions couldn’t beat Chile after 120 minutes of scoreless play on Wednesday. 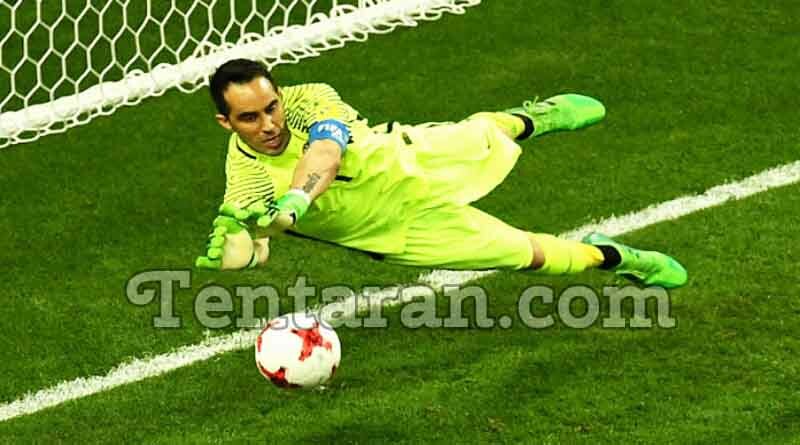 six saves against Portugal, three of them in the penalty shoot-out, gave the 34-year-old Bravo a night to remember. Portugal started well to create most of the chances in the opening period but Chile gradually grew into the game to threaten more. Both teams had chances in the match. Portugal had more, Chile had better. A tired Chile had had to withstand constant attacks from Portugal, who just couldn’t quite find a way past Bravo or his defense over 120 minutes, with wasteful shooting, predictable crosses, and fatigue. Chile might have wrapped up the game, but were denied a last-minute extra-time goal when Arturo Vidal smashed a shot across the goal and hit the post, with Martin Rodriguez stabbing the rebound onto the crossbar. There was yet more VAR controversy as a clear penalty for Chile was not spotted by the television officials during extra-time. Replays showed Portugal defender Fonte clearly stood on the foot of Francisco Silva as he went through on goal. The video assistant referees are able to notify the on-pitch official if a blatant error has occurred, as was the case, but play continued with no spot kick being awarded to Chile. With the match going to penalty shootouts, it was Claudio Bravo who turned out to be the unlikeliest of heroes. Chile made all three of its attempts, while Portugal missed all three. Ricardo Quaresma, Joao Moutinho, and Nani had their low efforts stopped by the Manchester City goalkeeper, who would have surprised premier league viewers after this performance. It wasn’t a classic but what a conclusion to the match. Chile will play the winner of Germany vs. Mexico in the final on Sunday in Russia.